Theo Van Den Hout, a professor of Hittite and Anatolian Languages, tells us about scribes in Mesopotamia and Anatolia. This short video was made for the Oriental Institute Museum special exhibit “Visible Language: Inventions of Writing in the Ancient Middle East.” In Chapter 3, you learned about scribes, the people who specialized in writing, the stylus, which is the instrument they used to write on clay tablets, and cuneiform, the wedge-shaped writing. Read more about the development of writing and pictograms on the British Museum’s website on Mesopotamia. Why do some historians identify the beginning of history with the beginning of writing? Tell me an interesting fact or two you learned about writing in Mesopotamia from one or more of these videos. I learned the historians try to identify the symbols. One thing I felt interesting about is that we can combine 2 word to make 1 word like car+pet= carpet!. I wonder how they learned or where they went to study? I learned that Cuneiform was written for a Babylonian audience which is a mix of Hebrew, Arabic and Harumake. Where do they speak Harumake? 1)That there use like a stick to do the letter. I learned that the tablets came in different sizes even though there was one standard size. I also learned that the Mesopotamians had vowels too. Two facts that I have learned from the video Scribes in Mesopotamia is: we know nearly nothing about the training of scribes in Mesopotamia and the cuneiform system consists of five basic lines made by the stylus. In this video the first thing I learned was that the language was from the Babylonian’s. 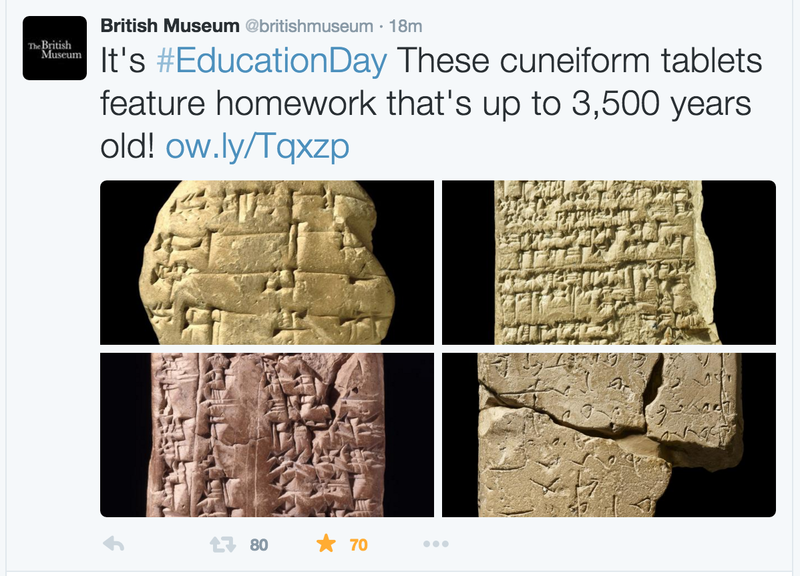 And I also learned about how to write the Babylonian’s words with the stylus. Stylus is this sharp object that is really similar to the chopsticks, but more thicker. The edges are only the sharp parts because it’s only for thick words. I learned that when historian were tried to solve meaning of pictograms, it’s so hard. I think it is just drawing. I learned that they put cat and car picture together to make the word carpet. I learnt that Irving Finkel and John Taylor have the LARGEST tablet collection and also work in the Middle East section. They have collected over 13,000 tablets from about 3,000B.C. to the first century. These tablets cover all the topics from History, all the way to games. They also cover marriage contract, divorce contracts, letters. These tablets mostly tell us about the high court and the king, and also private letters about daily life. One of the most prized tablets are the royal games of Oor, a board game played at about 2,000 B.C. This game was played all the way through Mesopotamia. John has put together a tablet that has been broken and has now been fixed and tells a story about a school boy. This writing is the oldest writing in the world. This writing has its own way of writing and puts itself together in its own way. more advanced form of cuneiform are found in relexed north. Very good reply. The first question was a challenging one and I am glad you chose it. We know much about Mesopotamia because of these tablets because they told us about their daily life. I learned about two Archaeologists found a cuneiform tablets in the Middle East. I learned that they use Rebus writing.For example car and pet= carpet and there were two letter and they combined 2 letters and made a letter or name. I learned that some people in the present, can understand and read, write, and speak cuneiform. Cuneiform is made of small, strong, hard, vertical and horizontal lines. The cunieform writing was used for everything to do with writing. They played a game called ore it was played since 2600 B.C. something I learned is that Babylonian is similar to Arabic,Hebrew and Aramic. I learned in video No.4 that scribes in Mesopotamia started the scribal training from a young age 10 or 12. I wonder how many years they studied? I knew that there are people who can read that language, and write it down. names where made out of 2 tings combined for example car and cat but not saying carcat you make cat=pet then you can get carpet this shows that people have developed a way to rite names. Scribes are very learned people and often but in essence, they were craftsman. The probably people who were train from a young age. True, they were very well-educated and worked with educated or powerful people. I interesting about writing made by the 4615 years ago.And I have a question that who made word. the upper part means 135 thousand leters. the right simble is the Item,barley . the left simble is how long they will have the items,37 months. the bottom left is his or hers name (woshen). that is all thanks!! One thing that was interesting was that a person who is talking learned the language and could write it without any help or looking back. I think it is really hard to learn those languages because there is many rules in it but he could read it and write it! it’s awesome. I learned that if people didn’t invented the writing, and did nothing, we couldn’t learn anything from them. So it’s really important to write there thoughts so that people after who sees it will learn from it. I learn that this style of scribe was training when the kid was very young, they started at 12 years old. I learn to that the scribes was from Iraq. I know now that they are a hundred of scribes and it was easy to remember it. I learn that the tablets was do by clay. Why do some historians identify the beginning of history with the beginning of writing? Some historians identify the beginning of history with the beginning of writing because before writing, we don’t know a lot of things but when they invented writing, we can learn more things because they wrote a lot of things down. I learned that cuneiform evolved from pictographs so the lines represent an image. Historians consider a starting of a writing as a starting of the history of that civilization because, the writing is the evidence of the civilization because by recording their life using their writing, historians can discover its starting. (exception; Korea. The own writing of Korea was developed in 645 and completed in 1443, by the Sejong the Great, but because they recorded their history using Mandarin, so historian could discover the starting of the civilization in Korea). In video #3, it was interesting that the single cuneiform is meaningless, they form a word when there’s another cuneiform. This is like alphabet. A single alphabet doesn’t has any meaning, but two or more alphabet can make a word which has a meaning. It was also interesting that they used writing to check their economic, like lending crop for the others. I learned that people used cushion clay to write down names and stuff they borrowed. They wrote names with the pictures which sounded like their name. The babilonian language is simmilar as hebrew,arabian language. I watched ‘number 2’ video. One thing that was interesting was they wrote important things(King or country) for report on the clay and, they used Babylonian language. Babylonian language is related on modern language of Hebrew, Arabic, Aramaic. I watched video #5, and one thing that was interesting was young school boys were trying to understand, to translate the writing. In video #3, I learned about they used cuneiform clay tablet that in video is believed to have been made around 2600 BC. they used pictograph and they wrote 2 object words and that created a sound of the different word. for example if they wrote “car” and “cat”, that means “carpet”. I watched number 2. In this video I learned that they used a stylus on a clay tablet to do their writing, their writing was called Cuneiform. In video 4, I learned that tablet’s size is 8 by 11. I learned that Ancient people used old language into a sentence. In video three, I learned that the cuneiform writing became more complex over time. More complex cuneiform was mostly found in Nippur. In video no.2 I learned that they write cuneiform in a chopstick thing called stylus and press them in a clay that is harden. In video I learned that the cuneiform is refereed to cushion clay that made around 2600 BC .It also shows detail if the transaction and grains. In video #3 I learn that cu and shion are mystery word. If they separate each have meaning but together it is mystery. People think it is some people name. One interesting I heard in video #3 was if we together car and cat it will be carpet because cat is pet so it will become carpet. In video number 4, I learnt that one of the reasons why the Mesopotamians changed from pictographs to cuneiform was because drawing round lines in clay is difficult and messy. I also learnt that scribes probably started learning the art from a young age to learn all the symbols. They know this because there was a bite mark in one tablet that was discovered, and when the teeth marks were studied, they looks like teeth of a twelve year old child. This may have the age they started, or just later on. The part about the teeth marks is funny. It’s amazing what these archaeologists and historians can learn about an artifact. 1, There are many different sizes of tablet. 2. They write on clay (tablet) so they can recognize image, things in daily life, etc.